So if you are a professional singer and need a lot tracks to sound exactly like the original song, you have reached the right place. We would make Karaoke tracks which will be a true copy of the original song (There can be a 10 % difference between the original and our track). They could be in any language. We can deliver you the track in either MP3 or Wave (Uncompressed) Format. 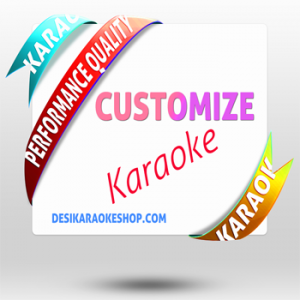 The rate for a Customized Karaoke is for a standard song with normal duration (4- 6 minutes). If the length of the song is too high or the song is too complicated, we will be charging more for the track. Once you place your order and send us the original mp3, we will review the song and in case of the above mentioned circumstances, we will inform you about the revised rate for making the track. If you agree to the price mentioned we will go ahead with the order, else refund the original amount paid by you. These charges are for one Customized Karaoke track. This song will be delivered through an email or a link will be added to your order. The Customized track will be added to our library and will be available to our other customers after 15 days of its delivery. If you a require a Exclusive Custom Track, the charges will be different. We do not deliver any kind of CD or DVD unless asked for and the shipping charges will be extra.